Because libraries are, at most 5% of a general trade publisher’s business and far less of the ebook business, and because the market is changing so rapidly and because every retailer except Amazon can be said to be struggling to carve out a sustainable position in the global ebook marketplace, there are many legitimate reasons for the biggest publishers to take a wait-and-see attitude about libraries and ebooks. The fear is of a “shopping and consuming” experience at the libraries which is comparable to what the retailers can offer. That potential is largely mitigated now because most of the big books don’t go to them. But, if they did, publishers fear the market could shift away from retail. That fear is not just about a “lost sale”. It is also about a “lost channel” of sales, or a pipe to the consumer that runs entirely through Amazon. Of course, libraries view this differently because the big books from the big publishers are a lot more than 5% of their patrons’ interest. This is an imbalance that would explain the difference in attitude of the parties, for anybody who cares to accept the reality of it. That is, the atavistic “instinct of self-preservation” leads libraries and publishers to somewhat different conclusions about what the best outcome would be and how quickly the industry should move to it. Saying this within a list conversation provoked a question from somebody from a library-centric point of view. Was I saying that the principle fear is that Amazon could “own” the lending experience, and that the traditional library channel and whatever sales it might secondarily bring would be lost? Or was I saying something else? Now, I actually hadn’t thought about that, although the way that the libraries collaborated with OverDrive to structure the deal for Amazon lending, that possibility became far more likely than it had been before. What I meant was that we already face the possibility that we’re headed for a single retailer for ebooks and print online called Amazon. Every other channel to the consumer, libraries and retailers both (whether they know it or not) are ultimately fighting for their digital lives. Publishers don’t want to do anything that weakens Kobo, Google, Barnes & Noble, or anybody offering a commercial channel to customers. It is perceived (intuitively, without data, although I would actually argue that there are great limitations to the value of data because we’re talking about the consequences as the ecosystem changes over time, not the situation at the moment) that giving ebook consumers ways to get what they want without paying for it weakens the other retailers. And, wouldn’t you say by Amazon’s behavior encouraging lending through libraries and outside them, that maybe they see that possibility too? I always expect an entity to act in its own self-interest, particularly when survival could be involved. (And Amazon, trading at 135 times earnings and facing the likelihood that their sales tax advantage in the United States is on the verge of being eliminated, is entitled to think that way too.) I think we should all understand that intelligent people on all sides feel that they are fighting for their survival. That includes Amazon, the publishers, the competing retailers, and the libraries. Our problem is that the interests don’t align and what I think people sometimes have trouble accepting is that it is possible they never will. The library fan was trying to understand “my argument” and attempted to summarize it. In the summary, the innocent conflation was made that I was suggesting that each library loan could translate to a sale lost and that even if they were divided propotionately, I was suggesting that Amazon’s competition would be hurt more than they would. But I really wasn’t trying to take sides or endorse any particular position in this dispute at all. I’m personally not sure whether library loans would spur sales or cannibalize them at the moment and, even if I thought I knew that, it would be another big leap to assume that today’s situation would persist into a different future. And I don’t think the publishers who are concerned are thinking about sale-for-sale; what they’re thinking about is the overall eco-system that is developing. I’m really not inclined to make judgments because there are too many things I don’t know about each company’s situation, where they are balancing agent relationships and, in the case of the three publishers that are investing in Bookish over here and two others investing in Anobii in the UK, plans to develop the channel themselves. But I think most of us agree that the price-per-read major publishers will be able to capture is very likely to go down. (Some optimists would argue that the number of reads will go up, but, of course, that’s of questionable comfort if the number of authored books available also goes up, and it will.) So publishers are highly conscious of that in ways they never had to think about when the price of what they sold was bounded by physical realities. These aren’t moral decisions, they’re commercial ones (even when they’re being made by not-for-profit entities.) I would expect smaller publishers to take advantage of most of the Big Six not being in the libraries by getting more sales and discovery for themselves (maybe the same way Random House is, at premium prices!) If the sales turn out to outweigh any risks or negative consequences, then the Big Six will come back in and that piece of the market will change again to the detriment of the upstarts. Meanwhile, some authors will have been discovered that wouldn’t have been if the Big Six had been there all along. It’s a very long multi-player chess game, not the Super Bowl. I tend to watch and scratch my head, not cheer for any particular team. I noticed in the most recent report about B&N’s results that their sales of print books through dot com is declining. A trusted resource who follows these things more closely than I do says that has been the case for a while. This looks to me to be a real negative for both B&N and the publishers going forward. The right way to think about how the future is shaping up is not to watch the split between ebooks and print books. That’s misleading. What matters is the split between books purchased in stores and books purchased online. Books purchased online are both print and ebooks. Intuitively, it would seem certain that print sales through online channels are rising. Certainly some of the former Borders store business went that way, and the trend should be in that direction regardless of any particular store or chain closing. If B&N’s print sales online are down in absolute dollars, then they’re getting really clobbered in share. When the history of Amazon’s growing dominance in the life of the book business is written, their dominance in online print will be an important part of the story. 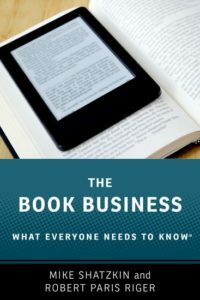 When Amazon bought The Book Depository, the UK Competition Commission made what feels to me like a massive logical error by looking at the book business as a whole, rather than recognizing that the growing online piece and the shrinking brick-and-mortar piece were really two different businesses. Although BD’s sales were mostly outside of the UK and their share of the UK online print business was miniscule compared to Amazon’s, they were a working platform that could have been a springboard to global competition for somebody; now they’re consolidated into the Amazon world. As I wrote recently, we’re headed to a time where most of our sales will occur online. Growth in Amazon’s share of online print adds to their potential industry dominance just as surely as Kindle growth does. And it is a post for another day, but we’ve just gotten a clear reminder that Amazon can adjust its trading terms as its position strengthens. I wonder if the voices that celebrate the consolidation of the business under Amazon are taking into account that the same thing could happen to them someday.